Winner of the Palme d’or for The Wind that Shakes the Barley in 2006, Ken Loach turns once again to the portrayal of a powerful and uncompromising character. 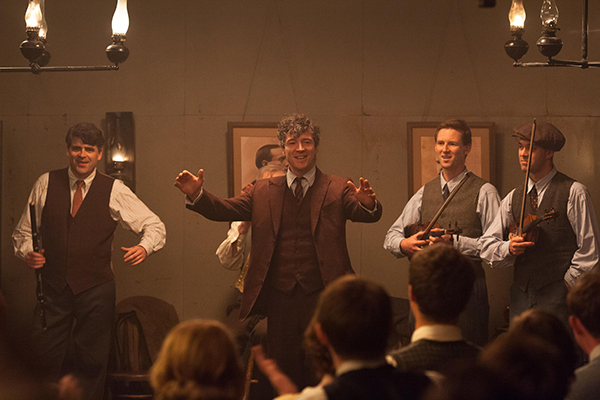 Jimmy’s Hall is Ken Loach's fourteenth participation in the Selection, with a feature film that is true to his style. Paul Laverty, Ken Loach's regular scriptwriter ever since the filming of Carla’s Song in 1995, once again leaves his imprint on the British director's project. He was even the one who suggested James Gralton's story to his friend, this story of a communist activist and local legend, whose community initiatives raised the ire of the authorities and the clergy in the conservative society of Ireland in the thirties. Ken Loach infuses all his energy into this vibrant portrayal of the life of a man who opened the "Hall", a community centre for dancing, music and education, the vector of radical ideas for those times. As a socially engaged filmmaker who stands for a cinema of realism, the British director continues to show his social vein: "I have always tried to capture the truth of the moment. The idea of a space that is open, resistant, and where progressive and revolutionary ideas are distilled in an oppressive society, that is what really inspired me". Jimmy’s Hall is perhaps one of the Ken Loach's last fiction films, as he admits in an interview with The Guardian that he finds a certain comfort in the documentary format: "With archival images, you don't have to recreate scenes from the thirties, as we did in this film". An intentionally provocative and didactic work, but also touching, coloured with descriptions of the economic depression that are strangely reminiscent of the present day. Thursday 22 May / Grand Théâtre Lumière / 8:30 a.m. - 3:30 p.m. - 6:30 p.m.